We had been watching these seals being nice and dry for about half an hour, until the tide started flooding their rock. It’s so funny to watch them curl up trying to keep as much of themselves dry as they can, attempting to avoid the inevitable. 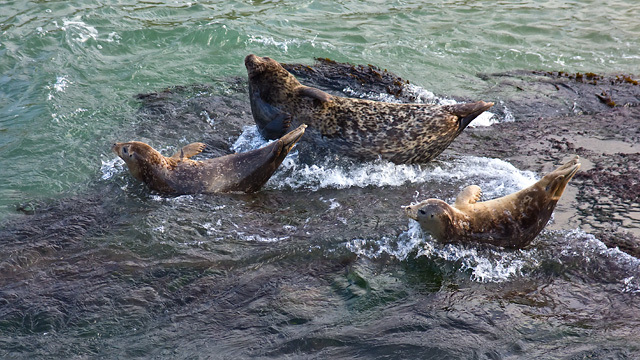 A few minutes later, the seal to the left decided that it was fighting a losing battle and went back into the water. On the technical side, this was a fairly low contrast scene and I slightly increased contrast in post-processing, something that should be done only with special care in my opinion. The shutter speed is middle of the road, assuring that there is no motion blur of the seals, and yet not freezing the water completely. I probably could have experimented with longer shutter speeds, perhaps down to about 1/120s, since the seals were holding fairly still. Anything even longer, and hand-holding the shot would have become difficult. For the pixel peepers, I suspect that the old Canon 28-105, which I love as a walk around lens on my 5D, isn’t quite up to the much higher pixel density of the 60D. Several shots I took yesterday with this combination seemed to be lacking just a touch in sharpness.